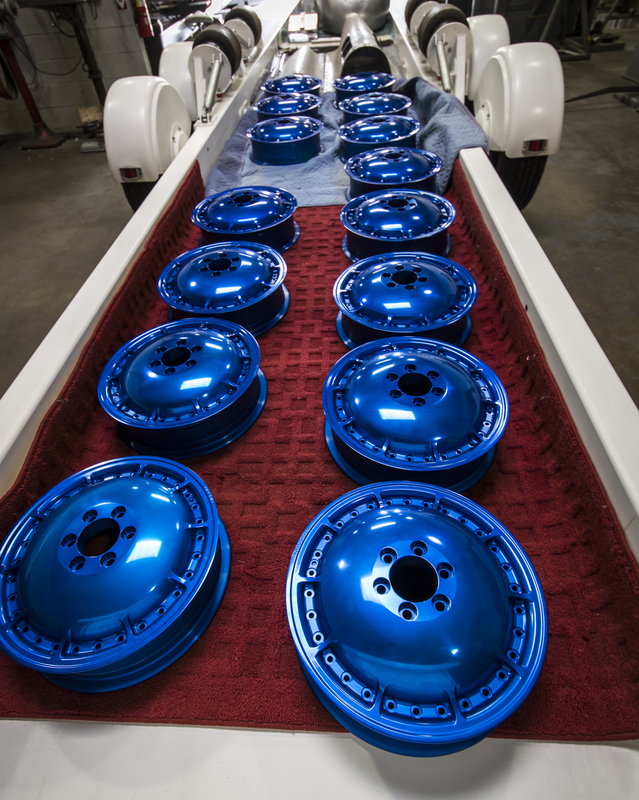 We love black and white, but this week we’re making an exception to show off our new wheels. 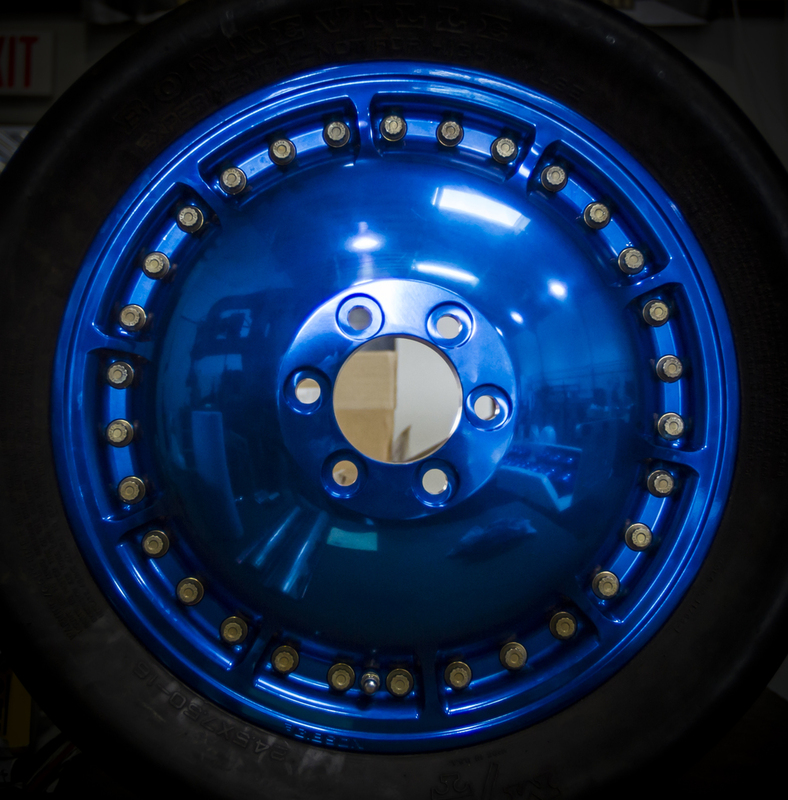 Designed by aerodynamicist Tim Gibson and machined by our skillful friends at S-K Specialities, these freshly anodized bad boys are officially ready to tear up the salt. 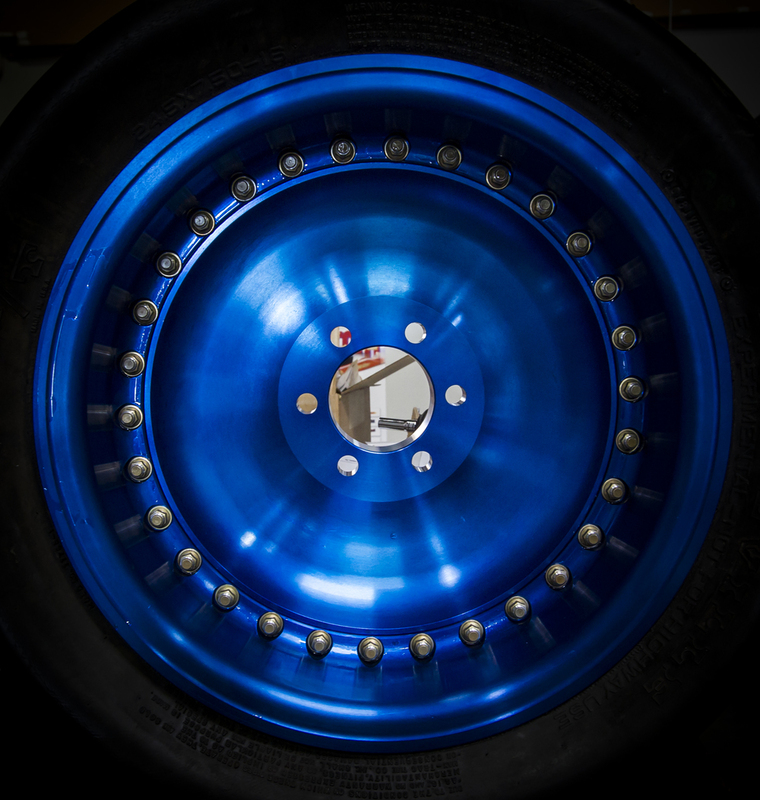 Each wheel starts out as two separate 120 pound pieces of 2024 T-351 aerospace grade aluminum billet. Over many hours that raw material is machined down to two parts; an eight pound inner half and a twenty pound outer half. The outer half requires a bit of extra work because it features ten additional milled pockets to further reduce weight. The two pieces are connected together by thirty reinforced aircraft bolts supplied by our pals at Coast Fabrication. Each 12-point bolt is torqued to exactly fifty-five pounds, resulting in 1,815 pounds of total clamping pressure. This compresses an o-ring, which provides the final seal. If that sounds like a lot of work, let us assure you, it is. 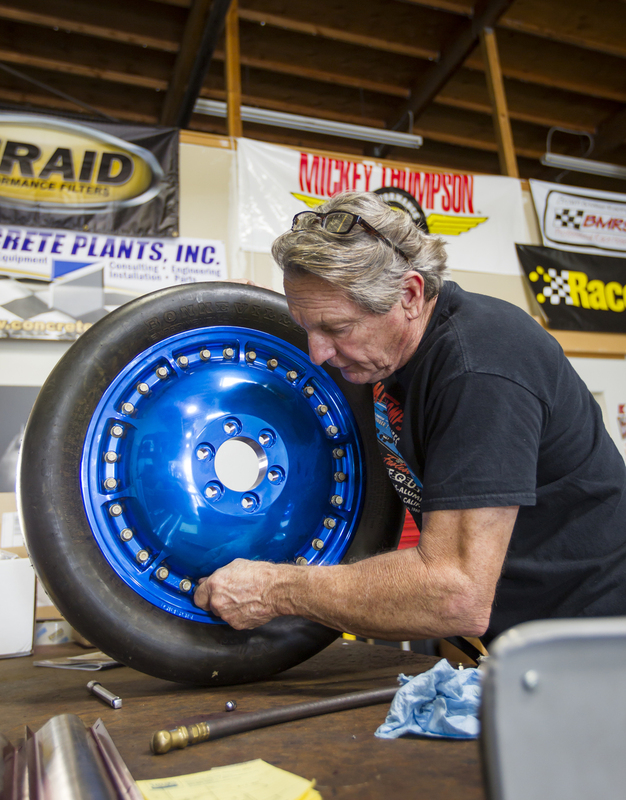 We’re often asked why we didn’t just make a one piece wheel, and we have two good answers. 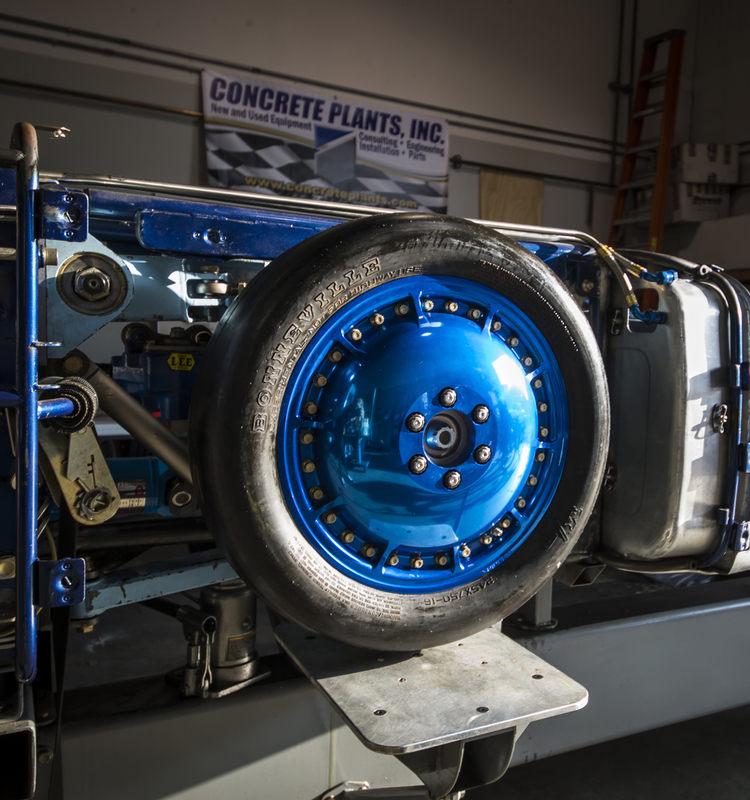 First, our car uses a set of four experimental Mickey Thompson tires. They are 4.5 inches wide, banded with steel wire, and extensively cross woven with nylon. There’s barely any rubber (1/32 of an inch), so forcing the tires to stretch over a one piece design could diminish their structural integrity. At 450mph, we want structural integrity. The second reason has to do with space constraints. The shape and offset of the inner wheel has been adapted to fit around the highly compact front suspension system. Tim’s extensive design work in this area allowed us to incorporate a new carbon fiber brake set, which should come in handy if the parachutes puncture or fail. We had four sets of wheels made, mostly because changing tires takes way too long at the salt, especially during the FIA mandated one hour turnaround. It also gives us a chance to match outside diameters well in advance in a temperature controlled environment. We’re not sure if we’ll have to change tires after every run (we hope not), but we want to be prepared for the possibility. It all comes down to how successfully we can control wheel slip, which is basically the story of every aspect of the car.